A service statute for Grama Niladharis was formulated to abolish official impediments that Grama Niladharis undergo when they perform administrative functions and implement State policies. The new ordinance will be implemented very soon, Home Affairs Minister Vajira Abeywardana said. 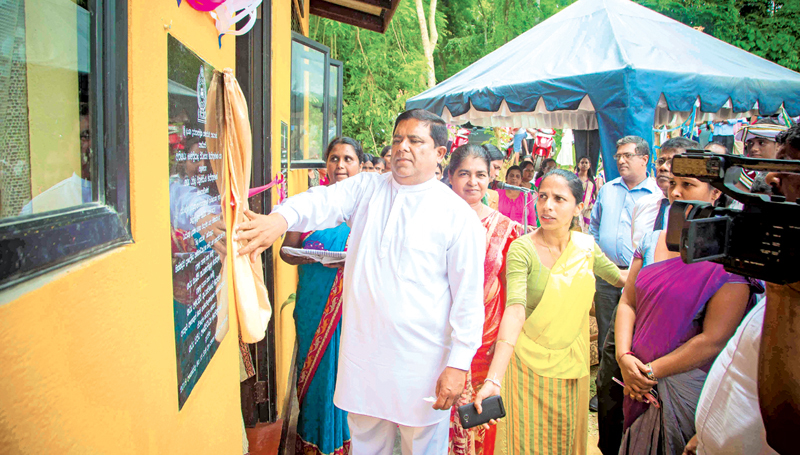 He was addressing the gathering at the inauguration ceremony of eight ‘Nila Sevana Offices’ in the Hikkaduwa Divisional Secretariat Division in Ambalangoda recently. The Grama Niladhari Service is among the oldest State services. It has been since ancient kings’ time under various names. The ‘Gammuladeni’ post was first replaced with the Grama Sevaka post in 1961. In 1989, it became the Grama Niladhari Service. Since then, this rural level administrative service lacked a service statute. Earlier, the Grama Niladhari Service had a parallel service statute. The Government Management Assistant Service abolished it. Thereafter, the Grama Seva Nilaadhari Service lacks a service statute from 1961, the Minister said. “We have now resolved the problem. We obtained views of Grama Niladhari trade unions. A special Committee studied and assessed the opinions and completed a new service statute. The draft will be submitted to the Cabinet for approval. The new ordinance will resolve many professional problems of the service,” the Minister said. Minister Abeywardana said Grama Niladharis suffer certain salary anomalies. “When awarding grades and promoting Grama Niladharis, they undergo many issues. We want to ensure an efficient and competent Grama Nilaadhari Service through a proper service statue,” the Minister said. The Home Affairs Ministry has launched a project to set up Nila Sevana Offices at Divisional Secretariats and one administrative centre will be set up in every Grama Niladhari Division under the project to facilitate the services of Grama Niladhari, Economic Development Officer, Agricultural Research Assistant and Samurdhi Officer, he said.